Driving into Florence is just not something I want to do. Even if you could find your way easily into the city centre, parking is as scarce as hen’s teeth and expensive. The bus to Lucca stops almost at my door in Ponte a Serraglio and then in Lucca I walk a few metres to the Florence DD (direct) Lazzi bus. 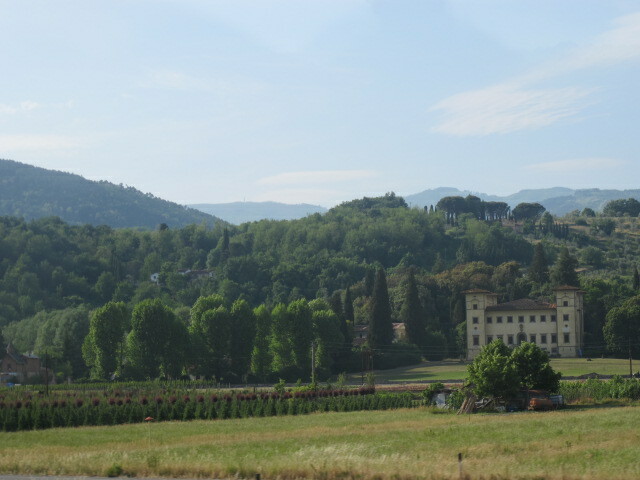 The bus to Lucca follows the Serchio river all the way and some of the views are spectacular. As well as being very convenient, the bus ride into Florence and back is great. 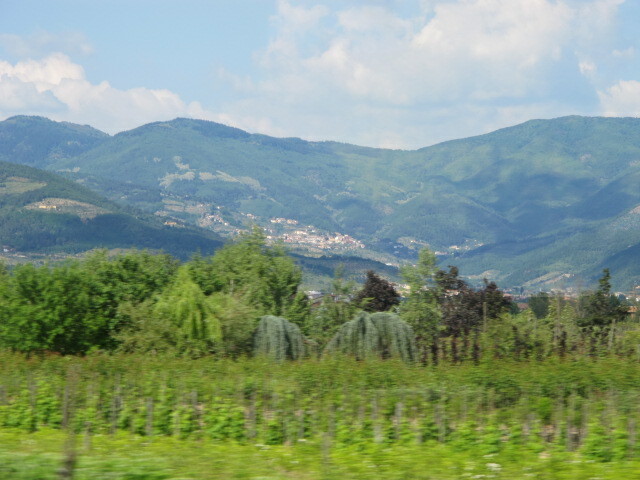 The direct bus whizzes along the autostrada and the scenery along the way is delightful. 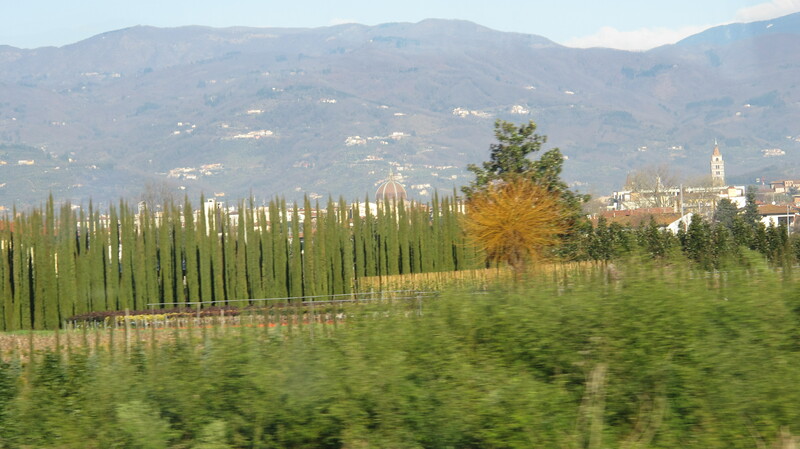 My favourite part of the trip is the area around Pistoia, where on either side of the highway there are plant nurseries. 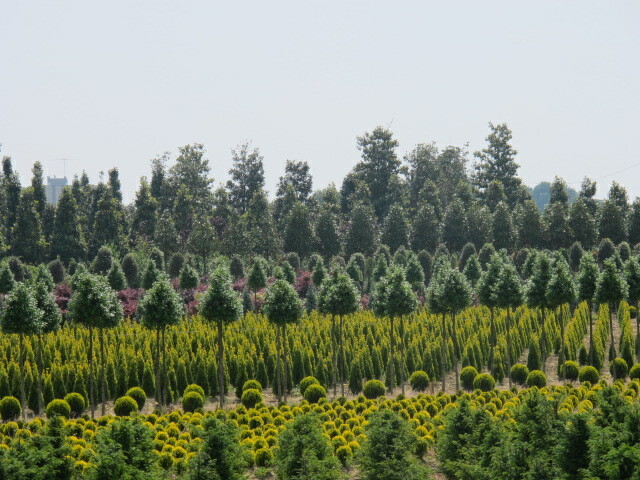 There are rows of perfectly manicured shrubs and trees being grown to be sold all over Italy and beyond. The nurseries really look great in spring with the plants coming to life, getting ready to find a new home . On a clear day you can see small villages tucked into the hills surrounding Florence. Keep an eye out for the old farm on the left just past the Alt Stazione before Florence. There is a large family of pigs, a couple of donkeys and chickens in a ramshackle cluster of sheds. I love the fact that this still exists so close to Florence. The bus is definitely the best way to get from Bagni di Lucca to Florence. There is a train, but the station is a kilometre from Ponte a Serraglio and the local buses don’t always connect well. As well, unless you catch an express train, it can take almost 2 hours to reach Florence and the constant stopping can be a drag. The best connections from the village and back are – 7.50am from Ponte a Serraglio, 8.55am from Lucca arriving in Florence at 10.10am. Coming back there is a DD at 3.40pm, connecting with the 5.10pm in Lucca and arriving in the village at 6.00pm. 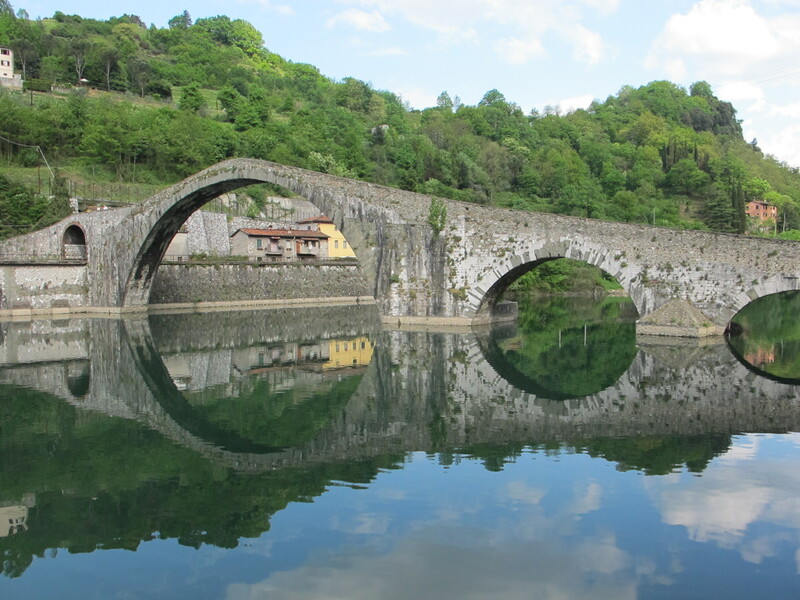 The 5.15pm from Florence connects with the 7.00pm from Lucca and arrives in Ponte a Serraglio at 8.00pm. These times are the winter timetable. The summer times are slightly different. Always check the timetable as they are subject to change. If you catch the 7.50am or the 5.10pm bus say hello to Massimo. He is almost always driving these buses. Some years ago, on our one and only day in Florence I drove there with white knuckles, then parked, possibly illegally, and spend the rest of the day worrying about the car while trying to enjoy the Uffizi. The bus could have saved a lot of stress.Next time…! Each time I take the bus to Florence I tell myself I will remember the way into the city, but I get completely lost after about the tenth turn and just give up. It is a great ride, but I have been known to doze off occasionally on the way home after a hard day wandering in Florence. We have never taken the bus to Florence. Generally, we drive and leave the car at the Santa Maria Novella underground parking. Expensive, but very convenient. 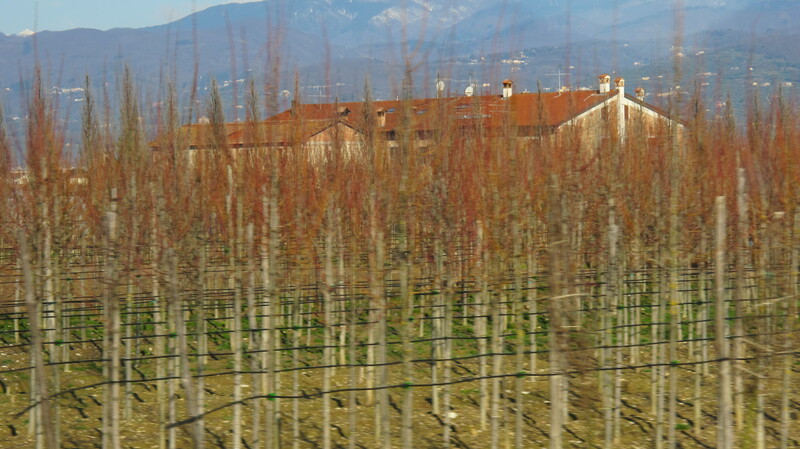 Sometimes, we have taken the train from either Lucca or Pistoia (driving via Benabbio and Boveglio) and it is not bad. Probably, we know our way by heart now, after so many trips and we do not find it difficult at all. And the nurseries near Pistoia are gorgeous. There are also a couple of interesting places selling pottery and garden statues. I have taken the train to Florence a few times, but I prefer the bus. The route it takes is prettier and there are no stops between Lucca and Florence. Sometimes i drive to Lucca and get the bus from there which gives more options for the return bus from Florence. You are clearly much braver than I am. The drive from the autostrada into the centre terrifies me. We took a wrong turn once because we were in the wrong lane and drove around the outskirts of the city for an hour. We have a satnav now which would help. I have been on a number of occasions, with Debra on the morning bus driven by Massimo and have to say he is not only the safest attentive driver but the best looking as well. Always a pleasure to be on the bus driving that picturesque route to Florence. Massimo is a wonderful driver and yes Di, he is also handsome. this is good to know. very welcome information. thanks debra for making our next trip to italy easier and also having more options. i love that succlent pig sandwich. i can’t stop thinking about it and the beautiful city i might never visit if not for your blog. my gosh that lsandwich looks delicious. i can see how tender it was. yum!!! I’ll see you in Bagni di Lucca one day George. The drive is very pretty. I’m sure you will stop at Devil’s Bridge for a while. I’ve just returned home from a wonderful week in the hills above Bagni di Lucca but didn’t have time this trip to make a visit to Florence. The information about the bus will go down in my note book for next time. We spent many a happy hour at Bar Italia as usual – your balcony still looks good! I was disappointed not to be able to get on to the internet via my new netbook to check out your blog while I was away. I’m not sure why I couldn’t get on the net – any info gratefully accepted! Thank you!. We have very good internet connect at Ponte a Serraglio. I don’t know what happens further out from there. I hope I catch up with you on one of your visits to BdL. I’ll be back in October. Best of all, when you’re on the bus, both hands are free to take photos to share with your readers! 🙂 Sounds like a perfect day trip, Deb! I have done the trip dozens of times and I love it every time. Delightful, absolutely. The first two photos are my favorites this time. The coloring in late winter in the nursery is great. It really is lovely at any time of the year. I would love to know where the plants end up. Looks amazing. 🙂 Love the villages tucked into hillsides, and the nursery. So pretty. Oh how I crave to be away from here, experiencing another world where every experience is new and exciting. I hope you get to go to Italy soon. I wouldn’t mind catching a bus if the views were always this pretty! You’d totally miss them if you were driving (if you are a decent driver anyway!). And having a handsome bus driver is just the icing on the cake. The bus journey sounds idyllic – I love your picture of the Devil’s Bridge. There are lots of photos taken at different times of the year of that gorgeous bridge in a couple of posts. I love taking public transport when travelling – it gives you an extra insight into the place as well as being much less stressful than driving in unfamiliar territory… which brings to mind the amount of times we got lost when driving in Greece!!! I have my Italian drivers licence and we have a car in Italy, but there are some places I just won’t go. The bus is so much easier. The buses run on Saturdays but the service is limited on Sundays and there are no direct buses. I hope you enjoy your trip to BdL.